Obituary – Wakeman, Ann (Evans) « Perry High School Alumni Association, Inc.
﻿Wrestling Queen Attendant ’58-’59; Band ’58-’61; F.T.A. ’59-’61; Girls’ State ’59-’60; National Honor Society ’59-’61; Honor Society Vice President ’60-’61; Football Queen Attendant ’60-’61; Home Room Secretary ’60-’61; Junior Play ’59-’60; Teen Town Council ’59-’61; Junior Rotarian ’60-’61. Ann Evans Wakeman, 64, of Edmond, Oklahoma was the daughter of Dr. Alfred and Mrs. Alameda Gordon Evans. 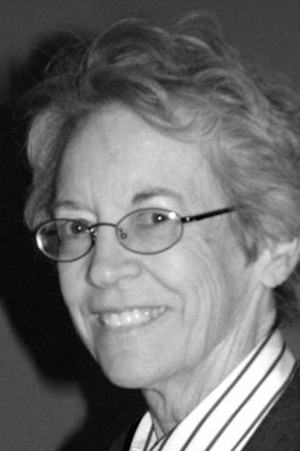 She was born June 10, 1943 in Oklahoma City, Oklahoma and died Monday, March 24, 2008 at Mercy Health Center in Oklahoma City from carcinoid cancer. 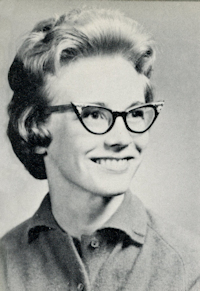 Ann graduated from Perry High School in 1961 and attended Oklahoma State University. She spent several years as the owner-operator of The Santa Fe Gallery in Edmond and as a bridal consultant at Dillards at Quail Springs Mall. An avid artist and hobbyist, she spent her free time drawing, wood carving, working on crafts and playing with her granddaughter. Memorial services will be at 10:00 a.m. Thursday, March 27, 2008 in the Brown-Dugger Funeral Home Chapel in Perry, Oklahoma. Rev. Ed Cook will officiate. Services are under the direction of Brown-Dugger Funeral Home. Memorials may be made to the Carcinoid Cancer Foundation in care of Brown-Dugger Funeral Home, 1010 N. 7th Street, Perry, Oklahoma 73077. Ann is survived by two sons, Jim Wakeman, of Dallas, Texas and Matt Wakeman, of San Francisco, California; one daughter, Jill Wakeman Fritts and her husband, Brendhan, of Allen, Texas; one granddaughter, Ava Fritts, of Allen, Texas; and one brother, Gary Evans, and his wife, Bettye Kaye, of Muskogee, Oklahoma. She was preceded in death by her parents and one brother, Larry Evans.